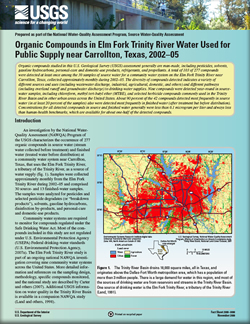 An investigation by the National Water-Quality Assessment (NAWQA) Program of the USGS characterizes the occurrence of 277 organic compounds in source water (stream water collected before treatment) and finished water (treated water before distribution) at a community water system near Carrollton, Texas, that uses the Elm Fork Trinity River, a tributary of the Trinity River, as a source of water supply. Samples were collected approximately monthly from the Elm Fork Trinity River during 2002–05 and comprised 30 source- and 13 finished-water samples. The samples were analyzed for pesticides and selected pesticide degradates (or “breakdown products”), solvents, gasoline hydrocarbons, disinfection by-products, and personal-care and domestic-use products. Community water systems are required to monitor for compounds regulated under the Safe Drinking Water Act. Most of the compounds included in this study are not regulated under U.S. Environmental Protection Agency Federal drinking-water standards. The Elm Fork Trinity River study is part of an ongoing national NAWQA investigation covering nine community water systems across the United States. Ging, P.G., Delzer, G.C., and Hamilton, P.A., 2009, Organic compounds in Elm Fork Trinity River water used for public supply near Carrollton, Texas, 2002–05: U.S. Geological Survey Fact Sheet 2009–3090, 6 p.